Note: Links in this post may include affiliate links which provide me with a small commission at no expense to you. These lines jumped A Name Unknown to the top of my favorites list. I don't remember a day that fiction didn't fill my thoughts, my heart, my life. Within the first pages, I was immersed into Peter and Rosemary's tale, in a setting that was as vivid to me as it could be. The characters became friends that I cheered on as they faced seemingly insurmountable odds. 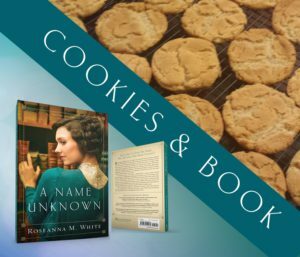 Roseanna M. White is a must-read author. She's talented at weaving stories with high-stakes, emotion, and flaws, while connecting them to the truth of who Christ is. I can't recommend this book more. This story has romance, suspense, history-- everything you could want in a book. I give this book 5+ stars. I was given a complimentary copy of this book in exchange for an honest review. All opinions are my own. I have seen several reviews of this book and they all raving about it. I can hardly wait to read this book! Am looking forward to reading this new book by Roseanna! Thanks for sharing!